I know bestseller lists are fleeting, but I just need to savor this moment. The Pickle Jar Chronicles Omnibus is at #23 on its genre’s bestseller list! I’m so happy! This entry was posted in Books on March 21, 2017 by Maggie Dane. 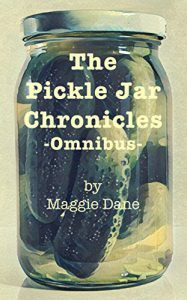 The Pickle Jar Chronicles Omnibus is Out! Have you been waiting for a collected volume of The Pickle Jar Chronicles? Your wait is over! Can a spilled drink lead to true love? What do pickle juice and poker have in common? Karen is about to find out. A widow for five years, Karen likes her quiet, orderly, single life just fine, but her pushy friend Georgia other ideas. A chance encounter at work opens up unexpected and, not entirely welcome, possibilities. Find out what happens in this series of connected short stories by Maggie Dane. All three volumes in The Pickle Jar Chronicles are included in this Omnibus edition. The final installment of The Pickle Jar Chronicles is out, just in time for Valentine’s Day! Joan and Karen are about to find out that the course of true love never did run smooth, as Shakespeare once said. The couple is forced to deal with a conniving mother, a missing cat, and two houses of furniture. Get your copy now! This entry was posted in Books on February 14, 2017 by Maggie Dane. I’m so happy to announce that the second short story in The Pickle Jar Chronicles series is now available on Amazon! For new couple Karen and Joan, trouble comes in threes. A cranky mother, a mischievous cat, and the stress of the holidays take a toll on our couple. Will their love survive? 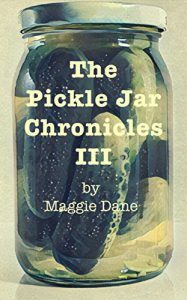 Find out what happens in The Pickle Jar Chronicles II. This entry was posted in Books on December 6, 2016 by Maggie Dane. I’m done with the next installment of The Pickle Jar Chronicles. I’ve still got some filling in yet to do, but I’m going to send it to beta readers before I do that. Looking forward to getting the short story in your hands! This entry was posted in Writing on November 19, 2016 by Maggie Dane. I’ll be working on the second volume in The Pickle Jar Chronicles during NaNoWriMo. If I get done with it before the month is out, I’ll start on something else. My goal is to keep writing every day, without fail, even if it’s just a few minutes a day. I have lots stories in my head, but if I don’t write, they don’t get out. You must write. I’m a technical writer, so I write every day. By the time I get home from work, though, I’m tired of it. But I need to get over it and write for at least a little while every day. This does not include writing Facebook posts or blog articles. You must finish what you write. I’m very good at starting something and not finishing it. That will change. You must refrain from rewriting except to editorial order. Because I self-publish with Comfortable Shoes Press, this means that I will make it as good as I am able, and then pass it to an editor and to beta readers, who can make suggestions that I can either keep or reject. You must keep it on the market until it has sold. I’m not selling this book to a publishing house, so the “until it has sold” part doesn’t apply. However, The Pickle Jar Chronicles and anything else I publish will stay on the market for as long as possible. This entry was posted in Writing on October 27, 2016 by Maggie Dane. The Pickle Jar Chronicles is now #11 in the Kindle Store>Kindle Short Reads>One hour (33-43 pages)>LGBT category on Amazon! Wow! That was fast! Thanks to everyone who is reading this little thing. This entry was posted in Books on October 11, 2016 by Maggie Dane. 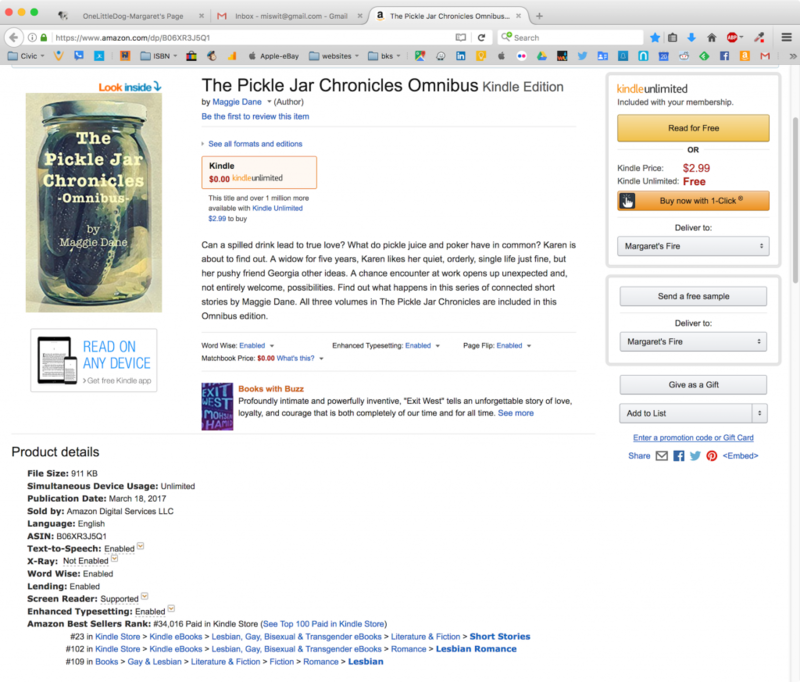 The Pickle Chronicles Now on Amazon! Can a spilled drink lead to true love? Karen is about to find out. A widow for five years, Karen likes her quiet, orderly, single life just fine, but her pushy friend Georgia other ideas. A chance encounter at work opens up unexpected and, not entirely welcome, possibilities. Find out in this debut short story by Maggie Dane. This entry was posted in Books on October 8, 2016 by Maggie Dane.